In California, Greenbelt Resources Corporation and Duckweed DAYS commenced their inaugural Duckweed Project to commercialize the duckweed model developed by the Andrew J. Young Foundation. Tests conducted during a pilot program indicated that protein extracted from duckweed was one of the most nutritious vegetable organic protein with essential amino acids, and the bio-refining process was efficient, sustainable and economically viable. Greenbelt will expand and refine the preliminary system that was proven successful during AYF’s pilot program, in which they invested $1.2 million. The findings were reported to the USDA in 2017 in a feasibility study. The total Duckweed Project cost is estimated at $14.0 million, of which $5.0 million is budgeted for Greenbelt’s system and technology. The initial design phase, has commenced with the funding provided. When complete, Greenbelt’s $5.0 million ECOsystem project, a critical component of the estimated $14.0 million total project cost, will produce up to 500,000 gallons of bioethanol per year, along with a protein concentrate that will be sold to organic feed mills and food ingredient manufacturers. The biorefinery is expected to be operational 15 months after breaking ground. Duckweed, a small, fast growing, protein rich, aquatic plant that floats on the water’s surface, can play a vital role in providing solutions to alleviate hunger and malnutrition and address food insecurity, water contamination issues, droughts and provide clean energy. On a local scale, The AJY Foundation believes duckweed can revolutionize agricultural landscape by providing an alternative cash crop for the farmers that would revitalize impoverished rural communities with new jobs, training and business and educational opportunities. In May 2013, we reported on a Princeton study on duckweed’s fuel potential. The researchers described four scenarios for duckweed refineries. Those technologies include conversion of biomass to a gas; conversion of the gas to methanol, or wood alcohol; and conversion of methanol to gasoline and other fuels. The results show that small-scale duckweed refineries could produce cost-competitive fuel when the price of oil reaches $100 per barrel. Oil would have to cost only about $72 per barrel for larger duckweed refiners to be cost-competitive. The difference these days? The shift to focus on protein concentrates as a primary revenue stream. Lemna Protein Concentrate, or LPC: LPC is a free-flowing powder containing a minimum 65% crude protein. We expect that our customer licensees will manufacture LPC for use in both animal and, potentially, human markets. Based on internal and third-party testing, we believe that LPC is similar in quality to fish meal. We believe that LPC can also be used as an alternative to kelp meal in fertilizer applications. Based on research conducted by the University of Idaho, we believe that LPC is strongly positioned as a fish meal alternative due to its nutritive qualities. Lemna Meal, or LM: LM is a carbohydrate-rich free-flowing powder containing a minimum 15% crude protein. We expect that our customer licensees will manufacture LM for use in animal feed markets. We also believe that LM could be used in fertilizer and animal bedding applications. Trials conducted by the University of Minnesota demonstrated that LM is a high quality alternative for alfalfa meal in diets for dairy cattle. Third-party testing is continuing with other animals that are customarily fed alfalfa, such as swine and horses. Fortification of Basic Human Food Products: We believe that LPC can eventually serve the global market for fortification of basic food ingredients for malnourished populations, particularly in developing and emerging countries. In the long term, we believe we can develop a higher protein content product from lemna using alternative separation techniques. A USDA-funded feasibility study conducted by Agregy Renewables on behalf of The AJY Foundation outlines a commercialization plan focused on financing and developing as many as 20 more duckweed bio-refineries over an eight-to-ten-year timeframe, initially in the southeast and western U.S. and then across the globe. If fully deployed, the commercialization plan represents more than $100 million in potential project revenues for Greenbelt over the next eight to ten years. ● Feedstock pretreatment: The feedstock pretreatment step (if necessary) prepares the feedstock for fermentation by making simple sugars available. Feedstock processing may include grinding or mashing up solid, and/or adding water, heat, and/or enzymes to break down starches or cellulose into simple sugars available in a uniformly viscous solution. ● Fermentation: The fermentation step is the process of adding yeast to a uniformly viscous liquid in which the yeast will consume the sugars and convert them into ethanol. ● Distillation: The distillation step is the process of separating out the ethanol by boiling the liquid to turn the ethanol, and some of the water into a vapor and then capturing the ethanol through a condensation process. ● End-product production: The end-product production step depends on the specific products being produced. For example, ethanol may require dehydration, for which we use our membrane dehydration module. Stillage may be sold “as is” for use as fertilizer or fortified animal beverage, or customers may request certain components be filtered out for such uses. The modules are sold as complete system or separately, are capable of delivery via standard container transport, and complete systems are deliverable in as little as seven months, with system footprints ranging from 3,500 sq ft to 12,000 sq ft and capacity options: from 50,000 GPY to 3,000,000 GPY. In 2012, Greenbelt sold its first system to the University of Florida for $593,000, and sold a second unit to a group of farmers doing business as Standard Ethanol Pty Ltd. for $1.8 million in 2013 (we reported that the system was ultimately commissioned in March 2017, here ) The company also operates a unit based in Paso Robles, California and provides contract manufacturing services and feedstock processing services. It’s been a long, tough decade for Greenbelt, and you can scan the highlights and lowlights here. http://www.greenbeltresources.com/investors/ It’s a micro-cap system developer with some customers and success stories and a long series of letters to shareholders thanking them for their patience and suggesting that success is hopefully around the corner. This one from 2010 tells the tale of some of the missteps in the 2000s and this goofy set of Q3 quarterlies released last November that, because of statements like “in addition, in 2015, we began providing contract manufacturing services to third parties…We hope to expand the contract manufacturing portion of our business in 2016 and 2017,” give the impression that not much is happening around Planet Greenbelt. But there’s been a steady stream of tests, and partnerships. We reported in July 2017 that the Indonesian government’s Technical Committee on Verification of Environmentally Friendly Technology has officially recommended that be awarded “Eco Friendly Technology” registration for Greenbelt Resources’ proprietary waste-to-energy systems process “ECOsystem” technology. Last October we reported that Greenbelt agreed to perform feedstock testing with Central Coast Wine Services to test various streams of wastes generated in the winemaking process. The wastes will be tested for potential use as feedstock for PRECO, Greenbelt’s “Paso Robles ECOsystem” project, a local waste-to-energy system. Last August we reported on cannabis progress with news that Greenbelt’s bioethanol would be tested for potential use by Natures Comfort Meds Biotechnology during its patented CBD extraction process. NCM Biotechnology’s CBD extraction process uses ethanol to convert the cannabinoids into liquid form, or oil. We first reported on the relationship between Greenbelt and the Andrew J. Young Foundation, in May 2017, here. In addition to demonstrating the viability of duckweed, Greenbelt recently completed successful tests on winery waste and brewery trub and found them to be suitable feedstocks for Greenbelt’s ECOsystem model. In February, Greenbelt began phase 1 of the “California BioEthanol Project,” and the biorefinery will produce approximately 1.37 million pounds of protein concentrate in this phase and 75,000 gallons per year of bioethanol. The total estimated investment for the California BioEthanol Project is $3.25 million with approximately $440,000 allocated to complete Phase 1, expected to commence during second quarter 2018. The California BioEthanol project uses locally-sourced food waste to produce industrial ethanol which can be used for extraction solvent purposes by the cannabis industry. The cannabis industry (including producers such as NCMBiotech and Puration) typically pays about $10.00 per gallon pre-tax for extraction ethanol as opposed to $1.60-$1.80 fuel ethanol rack prices. On the yeast protein concentrate side, Greenbelt noted that local animal feed providers are looking to purchasing the project’s yeast and other protein concentrates for sale at $0.40 to $0.60 per pound as compared to $0.03 per pound for other more traditional feed uses. The feedstocks? In this project, Greenbelt has relationships with local breweries including BarrelHouse and Firestone and wineries including CCWS and PRWS, ending waste to Greenbelt for processing in the facility – for cost savings and as an more eco-friendly option. Every so often, duckweed comes back in vogue, and it may well prove the right combination for Greenbelt in its long quest to find a market for its modular approach to protein and ethanol production from novel or waste feedstocks. 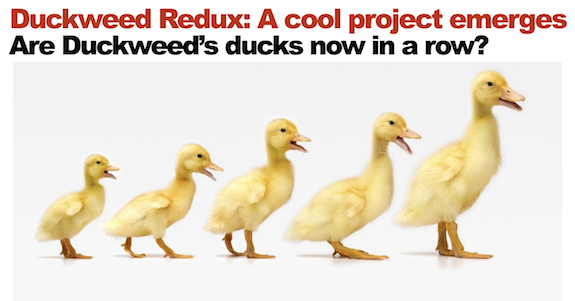 But sometimes we think about how Algae’s formidable Dr. No, John Benemann, used to say “when algae biofuels look good, we’re in trouble.” Duckweed’s been as pesky to commercialize as any feedstock. For sure, the options for a high-value protein concentrate and for cannabis extraction solvents offer some unique pathways to profit for small-scale systems. Not sure how that’s going to feed the world, exactly, cannabis that is. Which will place quite a bit of emphasis on finding the right combination of small farmers needing a cash crop and a high-paying market for the protein concentrate — given that the systems will likely be too small to produce competitively-priced ethanol except in micro-markets with special distribution challenges.